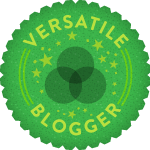 I’ve been nominated for The Versatile Blogger Award! Let the nominated bloggers know that they have been nominated for this award. Thank the blogger who has nominated you. I am a Wiccan, and have been now for nine years. Despite not being able to do a handstand, I can turn a mean cartwheel. I have eyes that are both green and blue. This entry was posted in Uncategorized and tagged author, blogs, inspire, promotional, reason, thoughts. Bookmark the permalink.